Wilton’s has won a RIBA National Award 2016 on top of its three London Awards. The final restoration has not only made the buildings structurally sound for the first time since its music hall days of the 19th Century, but is much loved by visitors as well as professionals. The road to the completed restoration has been long; kick-started by John Betjeman in 1965 fighting proposals for demolition. 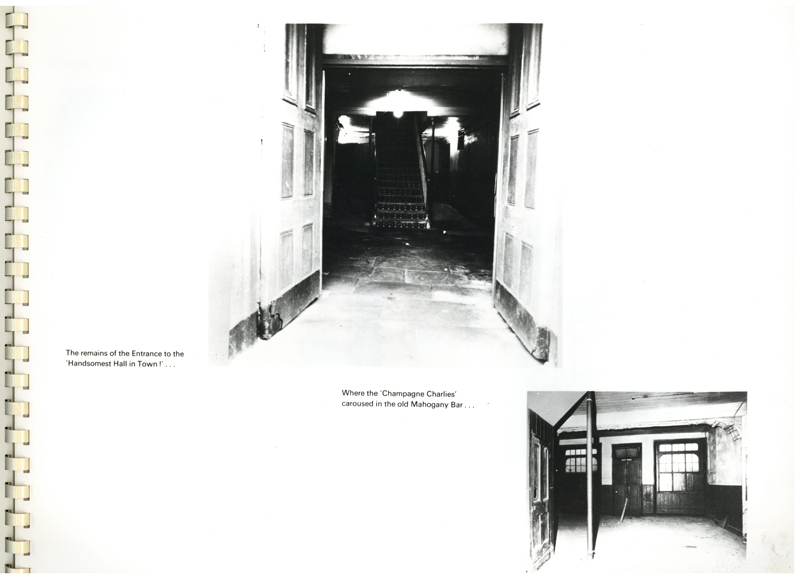 Campaigning over five decades drew many proposals for use of the space and different interpretations of how best to restore the decaying structures. Plans have swung from small scale stabilisation of individual spaces to grand schemes encompassing large swathes of the neighbourhood. All unrealised until now. 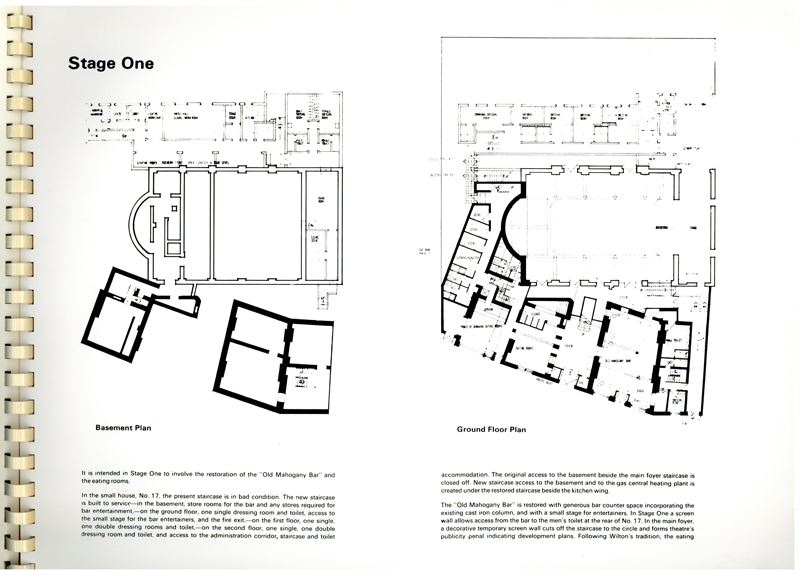 These plans are the earliest known scheme for comprehensive restoration, drawn up for the first Wilton’s Music Hall Trust by J. R. Notman, ARIBA, MSIA in the early 1970s. As well as being an accomplished architect, Notman designed for theatre, film and television; appropriate given Wilton’s heritage and future. 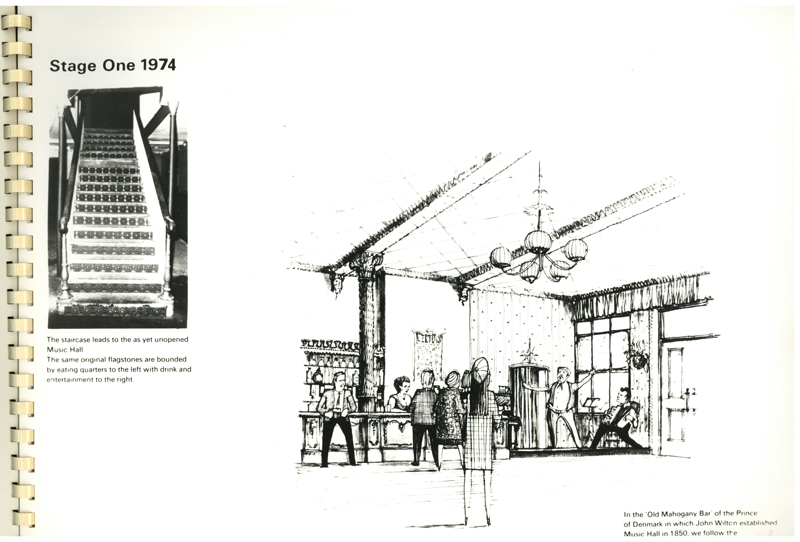 His artistic flair can be seen in his sketches for the finished building. 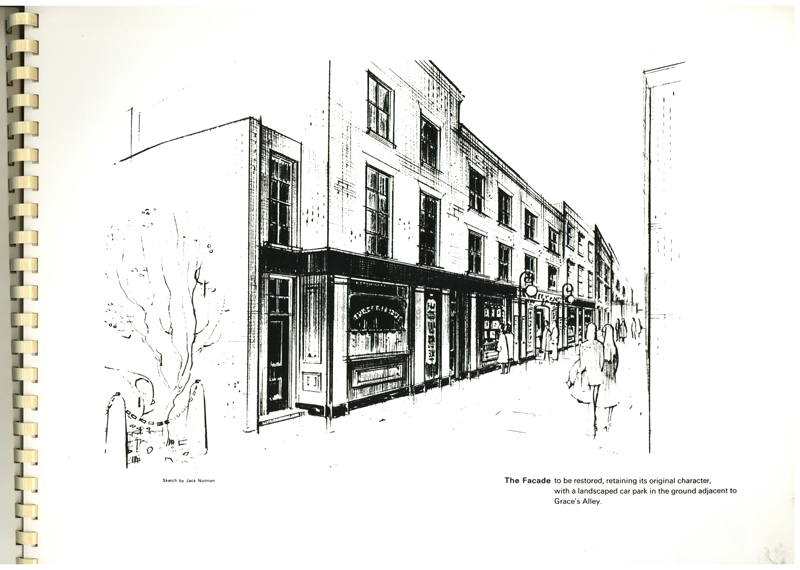 It is interesting that almost all the proposed schemes start with restoring the bar. Although clearly a commercial imperative it is also appropriate from a heritage perspective as the Prince of Denmark bar existed on the site for more than a century before the music hall arrived. Even the Methodist mission retained the name Old Mahogany Bar, despite its contradictions to their cause. Unique to this proposal are the Albion Dining Rooms, a more formal dining area perhaps encouraged in part by the survival at that time of plaster and woodwork which would later be removed as building works were begun, stalled and begun again for a new scheme. Much of the rest of the design echoes the final project, including using the end house 17 Wellclose Square as the support spaces for the restored hall. 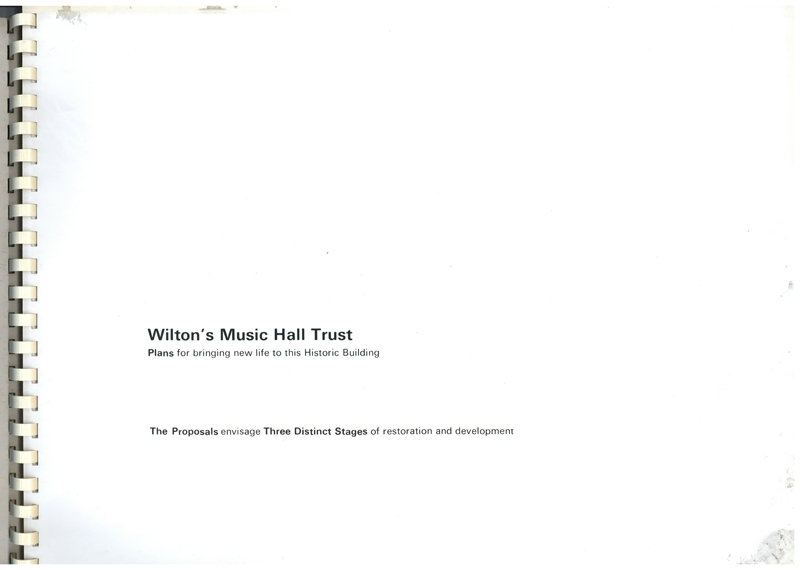 This, and many of the proposals, adds an extension to Wilton’s. Here it was proposed to house a National School of Variety, an idea revisited in numerous forms across schemes. Although we have ultimately not expanded Wilton’s, the learning and outreach programme is far broader in its scope than a dedicated school would have serviced. Although a worthwhile and ambitious scheme we are lucky that the misfortunes and set-backs that frustrated previous attempts refined the final designs and gifted us the innovative restoration we have today.